Just pay for your fibres and we'll blend them for you! Scroll down to see the colour chart. Simply choose your colours and we'll create your personal blend, absolutely free! You can add silk to your blend, giving that extra little touch of luxury and we also have the option of an extra pass through the machinery, combining your chosen colours even more. And despite this service being free, we don't skimp of quality: The merino in you blend will be the same 21 micron wool that makes up our entire Dyed Merino range, so you can be sure you're getting the best quality there is. 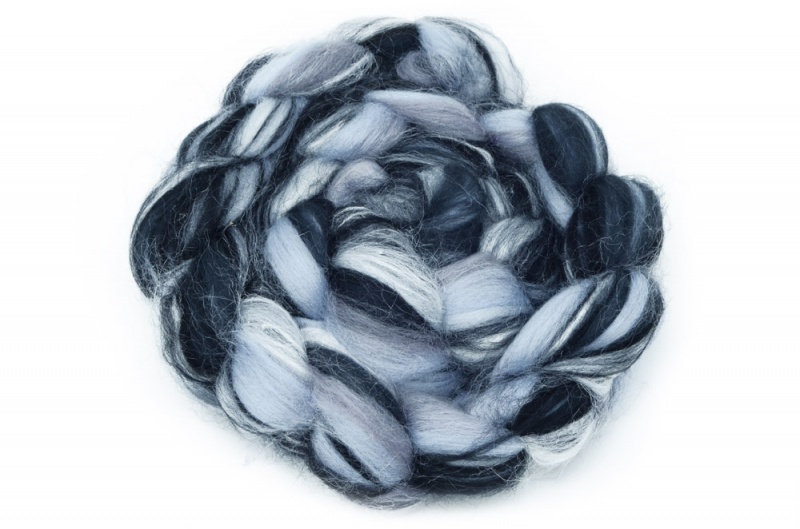 All of our blends are put together using 5 "strands" of wool, so you can chose any five of our merinos to make your blend. You don't have to use 5 different colours, you just have to make sure they add up to 5. So, you could have 2 strands of Blue, 2 of Red and 1 White. Or any other combination you like! We make our blends using 2 passes, meaning it gets 2 runs trough the machinery to help comb the fibres together. The more passes you choose the more blended your final mix will be. If you're unsure then we would suggest 2 passes. Your first and second passes are free, though if you'd like a third pass then there is small surcharge. 1 Pass: This gives a very stripey blend. While the colours are mixed together it is still possible to pull them apart if required. 2 Passes: We use 2 passes for our own standard blends. 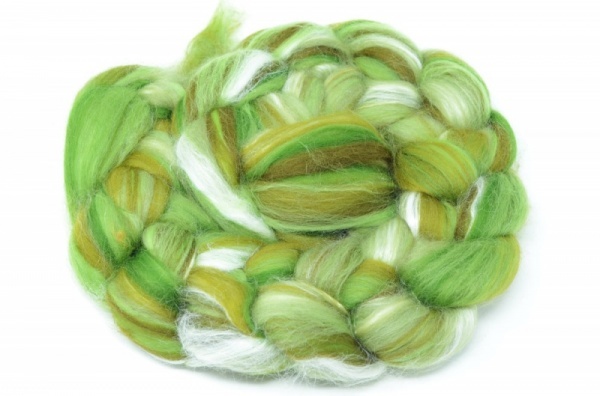 This mixes the colours up well into a single strand and still give a nice effect when spun to yarn. 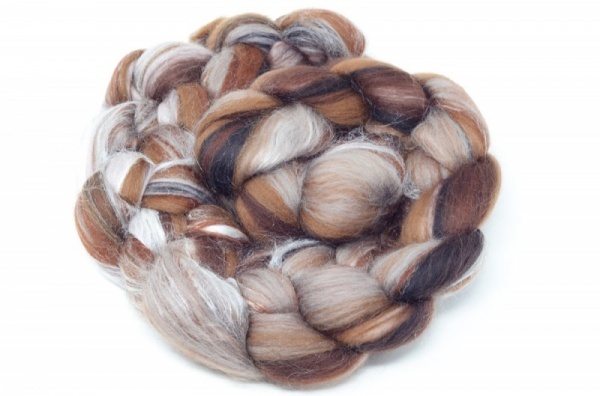 3 Passes: This creates a well blended strand, with the colours mixed in well together. This mixes the colours up well together, giving a nice effect if you're felting. Step 3: Would you like silk? 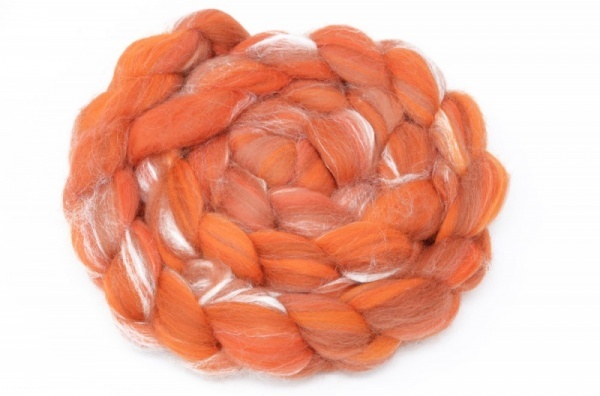 If you choose this option then we'll add White Tussah Silk to your blend. It gives a very nice effect and makes your blend that little bit softer. Step 4: How much would you like? Once you've made all your choices then the price will be calculated automatically. The price quoted is per 500gms. and include the cost of the fibres and the blending service itself. We generally run custom blends through our machinery in batches, twice a week, so there may be slight delivery delay depending on when we receive your order. ​Custom Blends are not available on our Priority Service. ​Returns: Under current Distance Selling regulations we are not obliged to accept returns for custom made items. However, if your blend isn't as you expected then do please give us a call and we'll see what we can do.